Not long finished a lesson using social networking and pirates. What follows is a brief description and evaluation of the use of Twitter and Facebook during the lesson. The lesson was filmed for a Teachers TV feature. This worked very well and allowed the students to revisit past lessons. I also shared some of my own ideas. View more documents from geogrocks. Next, I introduced the task ( or mission in this case). The pupils were to use their new knowledge and understanding to let my Personal Learning Network (PLN) know all about modern day piracy. 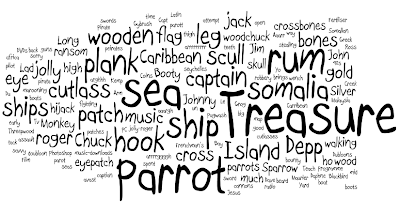 To introduce the task I had sent a Tweet on Tuesday asking my network to state the first 5 words that they associate with the word ‘pirate’. I also asked for their location, but in the end didn’t use the information. To provide a contrast I also posted a similar request as my Facebook status. The idea of using social media here was to provide a real world context and data: this wasn’t just something that I had made up but addressed a real need. Before revealing the data – I asked the class how many people they thought had responded to my requests. I told them that approximately 500 people are connected to me via facebook and twitter. Overall 42 people responded, less that 10%. The class were very quick to realise the implications of such a small sample size: it was neither representative or enough evidence to base sound conclusions on. 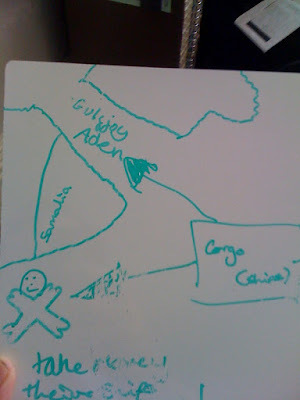 One pupil used the example of ageing cream to illustrate the point further. This was an excellent discussion that tackled the issues behind using data and opinions to form firm conclusions. In summary, we couldn’t support the statement: the whole of the UK has a stereotypical and romantic view of pirates. The Wordle above summarises the responses. We talked a little about the random responses and the possible causes for this. Again, another excellent way of understanding information and its limitations. This gave the pupils a real audience as the work they are producing will be shared via my Twitter account. They were also happy to see that the responses mirrored their own comments shared via my blog. I found that this was an excellent way to motivate and interest pupils. The class also realised that they would have to change the format of the work they had already done – mirroring real world work situations. The pupils quickly agreed that they would have to support any ideas that they had. The lesson then allowed pupils to work collaboratively to produce some responses to the questions and ideas posed in my tweet. 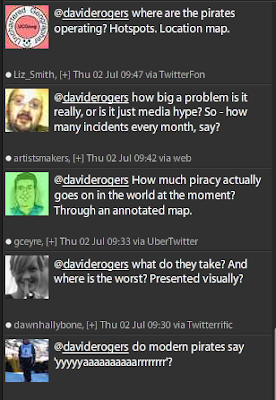 The tweets continued to come in, and I used them to remind pupils to respond to their audience. To finish, I got a number of the class to respond to my network via my Twitter account. This produced some excellent engagement and discussion, especially as they received some responses. Again, this was rather ad-hoc but demonstrated the power of social networks in driving learning. Overall, the lesson has convinced me that social media can be successfully used. Like any tool, it must be used where appropriate and not used too often. Many thanks to Tony Cassidy for the original pirate inspiration and to all those on Twitter and Facebook that took the time to respond – I hope I can repay the kindness soon.